Ohsweken, Ontario – June 19, 2013 – Ohsweken Speedway’s 18th season of racing continues this Friday, June 21 when RPM Designs presents the Corr/Pak Merchandising Sprint Cars versus the Patriot Sprint Tour, plus the Affordable Towing & Recovery Thunder Stocks, HRW Automotive Mini Stocks, and Gale’s Auto Aftermarket Bombers. This Friday features the first of three challenge events between traveling Sprint Car series and the regulars of the weekly Corr/Pak Merchandising Sprint Car division, with a $2,000 prize on the line for the feature winner. 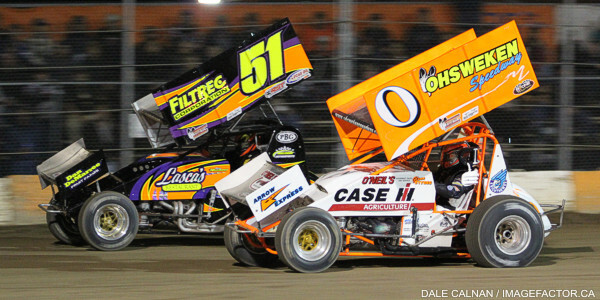 The New York-based Patriot Sprint Tour travels to Canada this weekend, with stops at Ohsweken on Friday, and South Buxton Raceway on Saturday. Quebec driver Steve Poirier has 5 career feature wins at Ohsweken, including 3 in the Canadian Sprint Car Nationals, and currently leads the PST Canada standings. 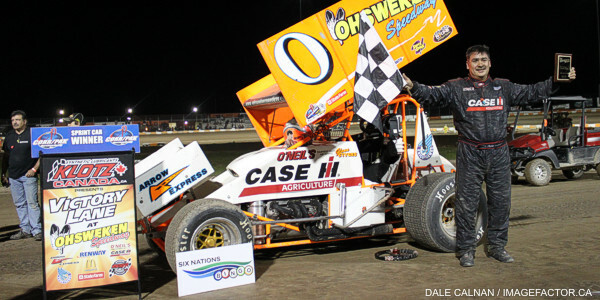 Poirier won the PST Canada series opener at Merrittville Speedway in April, and also won in his most recent start at Ohsweken – the 2012 Canadian Sprint Car Nationals. New York drivers Justin Barger, Tommy Wickham, Brad Knab, Scott Kreutter, Jared Zimbardi, and Steve Collins are among the PST regulars expected at Ohsweken on Friday. Glenn Styres has won 3 of the 4 Corr/Pak division events held so far at Ohsweken in 2013, but 2011 champion Jim Huppunen leads the points standings, followed by Styres, Jamie Collard, Mitch Brown, and 2012 champion Chris Steele. They are just a few of the regulars of the Corr/Pak division ready to defend their home turf this Friday against the invaders from the Patriot Sprint Tour, plus wild cards like New York’s Jessica Zemken, and Michigan driver Dustin Daggett, an 11 time feature winner at Ohsweken who has indicated he will be racing in Canada this weekend. Cory Turner scored another podium finish last Friday, and now enjoys a 32 point lead over Jim Lampman, with Lee Winger, Chris Dickie, and 2012 champion Mike Thorne also giving chase. Karl Sault was awarded the feature win last Friday, and continues to lead the Rookie of the Year standings. Davey Boughton scored another Mini Stock feature win last Friday, and now has a 37 point lead over second place Robin Elliott. Alex Schuts, Jason Lungaro, and Laura Hughes round out the current top 5 in the standings. Boughton also leads the Rookie of the Year standings on the strength of his 3 feature wins in 4 starts. 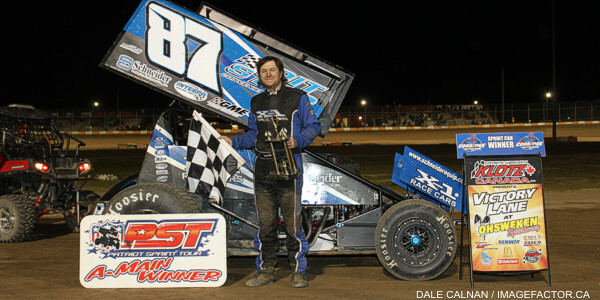 Dusty DeBoer scored his first feature win of the season last Friday, and moved up to second in the standings behind Brady Longboat as a result. Jesse McDonald, Tim DeBoer, and Max Chechalk also hold top 5 spots heading into this week’s event. Ohsweken Speedway’s 18th season of racing continues this Friday, June 21 when RPM Designs presents the Corr/Pak Merchandising Sprint Cars versus the Patriot Sprint Tour, plus the Affordable Towing & Recovery Thunder Stocks, HRW Automotive Mini Stocks, and Gale’s Auto Aftermarket Bombers. Weekly Friday night racing at Ohsweken offers affordable, exciting, family entertainment just a short drive from many Mid-Western Ontario locations. Adult general admission for this Friday’s special event is $15, while admission for seniors and students is $12, and kids age 12 and under are admitted FREE! Spectator gates open @ 6:00pm, with the first race taking the green flag at 7:30pm this Friday, June 21! Visit the new official Ohsweken Speedway website at www.OhswekenSpeedway.com and Feel The Excitement!